Some moments are huge, and they announce themselves right from the start. The moment when we answer Yes (or No) to what seems like a big question. The moment we first hold our baby in our arms. The moment our heart breaks and we’re not sure it will ever heal. Other moments are just as big but they dance into our lives without any warning. We barely know they’re there until one day we turn around and BAM! Our terrain is completely altered yet it takes a little bit of looking back to find “it.” To find the moment. The Happiness Sprinkling Project was not meant to be a Project, even less a Movement. It was meant to be a goofy hour of fun with a few friends. Still from Facebook, I asked: “What do you want your Sign to say? If you are going to stand on a street corner and broadcast a message, what do you want that message to say?” And within a couple of hours, I had a list. 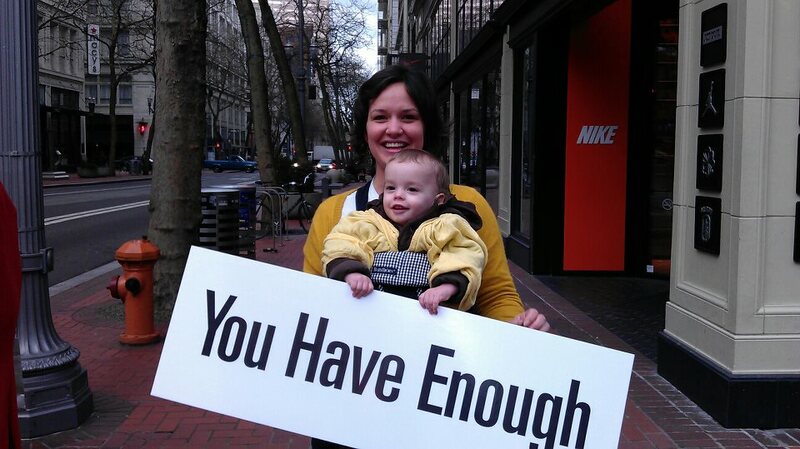 “You ARE a good parent.” “Everything is going to be okay.” “Sure, You Can.” “You Are Loved.” And more. We were all pretty darn excited – you’d think none of us had jobs to pay attention to. This was happening so easily, I just knew we were going to have a great time. Next, as I “designed” this one hour bit of fun in my head, I felt that to bring some visual balance to what was sure to be a wild group of Sign-holding peeps, we needed some consistency, something to tie us together. In the same way that I create a painting, I created the scene in my mind. And I saw that (1) the signs had to be super legible and all in the same font, and (2) we needed to be united by a color theme. I called a friend who has a local printshop, presented my strange idea to him and asked him if he would print our Signs. Because he is who he is – and because this thing was ready to be born, he said YES. Then I asked everyone to show up wearing bright yellow. There was honking, there was waving, there was jumping up and down, and more than anything there was an extraordinary amount of JOY. No agenda, no plan, just a bunch of people who together, had said YES to the moment. Moments Contributor Laura Lavigne is a life coach, author and tribe builder. She is the director of the Anacortes Center for Happiness, creator of the Happiness Sprinkling Project, 90-Day Gratitude Challenge and Anacortes Happy Hour. 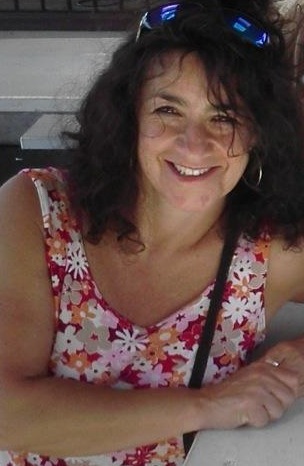 She lives on Fidalgo Island and you can visit her at lauralavigne.com, and view her talk “Go For Joy” – Laura Lavigne at TEDx. Following our over the top, bubbly hour of what had by then been coined a “Happiness Sprinkling,” the twenty Signs found a spot in my garage. Where I thought they would stay. The summer passed and I did not give the whole thing another thought. It had been good, we had some great photos and really, that was enough. 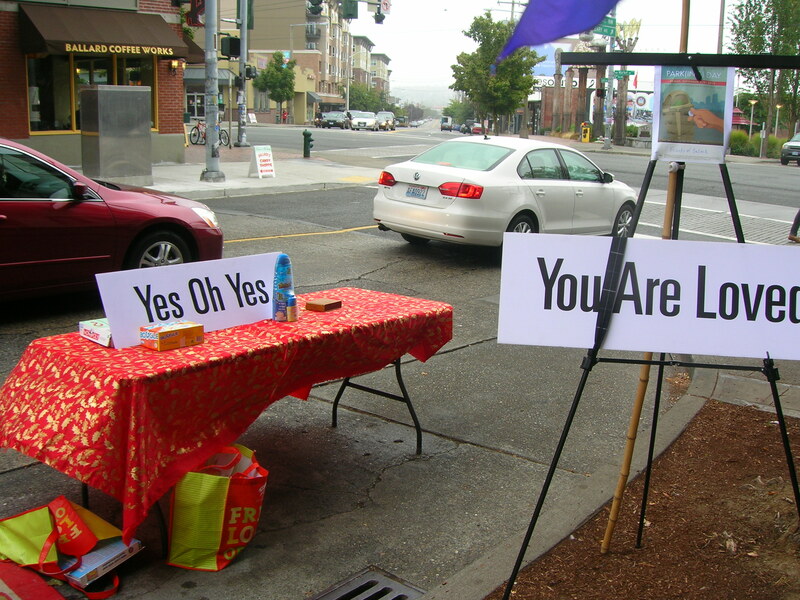 In September, a friend invited me to join her in Seattle to celebrate “Parking Day,” and at the last minute, I decided to grab a few of our Signs to decorate our parking spot. 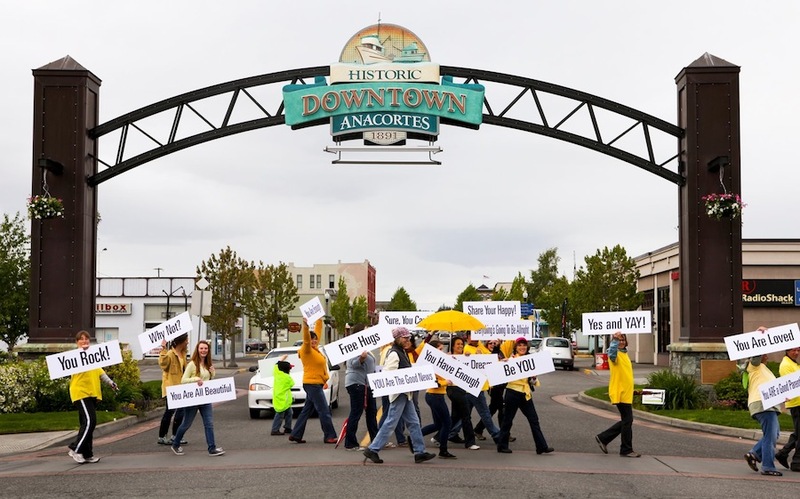 The day was fun and as we were wrapping up, I asked if anyone wanted to join me and wave the Signs, on the street corner. It was 5 pm on a Friday in Ballard, and I thought we would have a ready-made audience, maybe light a few people up. Passersby joined in, asked to hold the Signs, asked to be photographed with them (a tender looking couple asked to be photographed holding the “Be You” “You Are Loved” and “Everything is Going to be Okay” Signs. They later explained that they had just dropped off their daughter to college for the first time and were going to send her the photo). Happiness Sprinkling in Ballard, Seattle, WA. 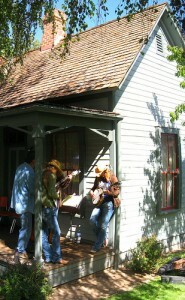 from anacortes happiness on Vimeo. A woman picked up the “It’s Going to be All Right” Sign and when I turned to look at her, she was holding it straight up in front of her … with a tear running down her face. It was surprising, touching and a little odd. The next day, I woke up knowing this needed to grow and I sure wasn’t going to stand in its way. A year later, here we are. 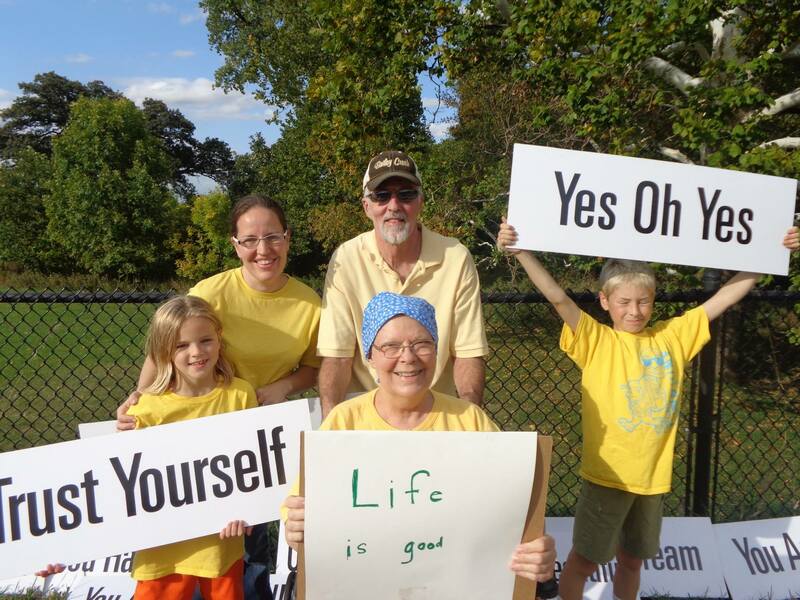 More than 50 events have taken place in over 40 cities across the US and into Canada, the sets of Signs being passed on from one “Happiness Ambassador” to the next, like a never ending chain of awesomeness. We have “Sprinkled” in posh Sherman Oak, CA and in L.A.’s Skid Row. In the snow and under the sun… from wheelchairs and from baby carriers. And every time, it is the same high, the same burst of deep, deep joy. Who “gives” and who “receives” is unclear. People meet, people hug, people laugh and people cry. Miracles happen. All this because of a moment. A very quiet moment. 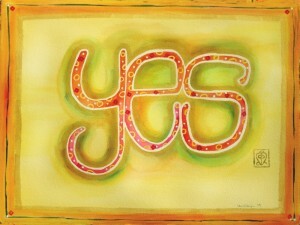 Of saying YES. Moments Contributor – Laura Lavigne is a life coach, author and tribe builder. 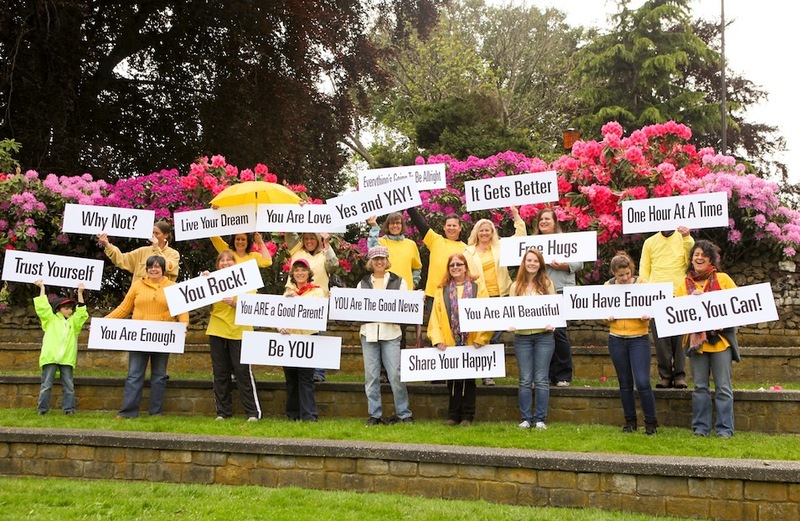 She is the director of the Anacortes Center for Happiness, creator of the Happiness Sprinkling Project, 90-Day Gratitude Challenge and Anacortes Happy Hour. 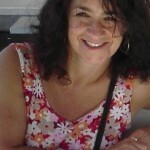 She lives on Fidalgo Island and you can visit her at LauraLavigne.com, and view her talk “Go For Joy” – Laura Lavigne at TEDx. Sit a Spell. That can Wait. 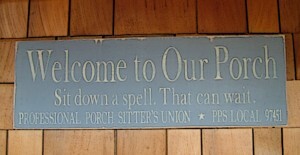 Since the summer of 2006, we have been a member of the Professional Porch Sitters Union. We’re PPS Local 97451. Our union motto is Sit down a spell. That can wait. 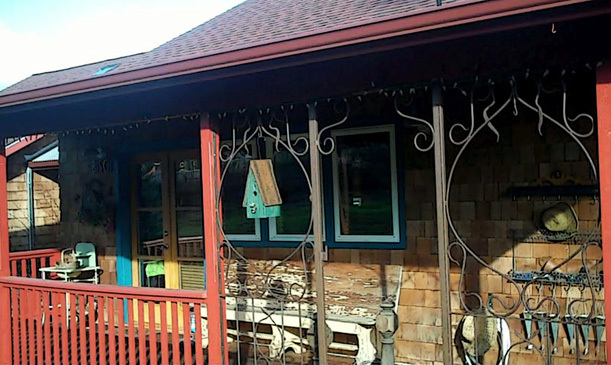 We had just built and moved into our country home with a large covered porch facing east towards the view of Siuslaw Valley pastureland, when we heard a report and interview on NPR with Claude Stevens aka Crow Hollister – Sitting on the Porch: Not a Place, But a State of Mind. Here’s an excerpt. “Porches were a necessity before air conditioning, whether it was the screened sleeping porch or the broad, columned veranda where iced tea — and gossip — were plentiful. In the mid-1800s, a well-known landscape gardener named Andrew Jackson Downing began writing about his vision of the American home — and how it could stand apart from English architecture. The porch was key. It functions as an important “transitional space between the private world of the family and the public realm of the street,” notes David Schuyler, author of a biography of Dowling. 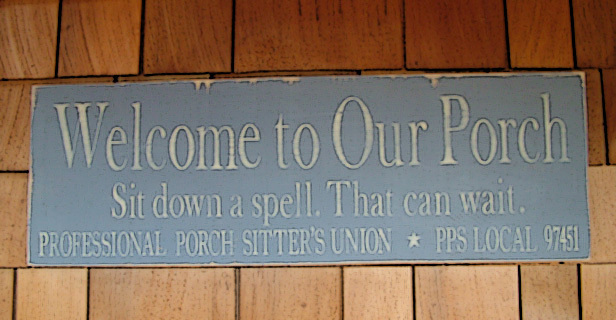 I contacted PPSU right away and within a week, our friend Heather painted us this sign, which hangs above the bench under the eaves of our covered porch. After two years of hard work, it was time for JustDucky and Chickadee to rest. One of the books in my library thatÂ I keep readily available for our B&B guest, friends and family to read while sitting on our porch is Front Porch Tales, as an eclectic mix of music, including Porch Songs and Back Porch Bluegrass, wafts through the tall open windows onto our porch. It was while sitting on our porch that we visited with guest from all over the world and heard their stories – the olive tree grower and movie producer from California, the land developer and white water guide from Idaho, couples traveling to buy Oregon wines from places as far away as Georgia and Italy… vinters and wine merchants, honeymooners, athletes, U of O alumni, parents and grandparents of U of O graduates, wealthy retirees, an east coast entrepreneur, a bi-plane pilot traveling the circuit, girlfriends having a time-out from their city life and splinting the cost of a room, local couples celebrating their anniversary and business professionals finally getting away for a night or two, cyclists and lovers of the Ashland Shakespearean Festival traveling en route through the back roads of Oregon…. stories, stories, wonderful stories. It was while sitting on our porch with a guest that I learned the secret of how to get a cork out of a wine bottle. We shake hands when they arrive and hug when they leave; strangers becoming friends. We no longer operate our B&B, but we cherish the memories and enjoy rereading our guest book. Our lives were greatly enriched by theirs. We have enjoyed wine-tasting, gourmet candlelit meals and potluck with friends and neighbors, wreath-making,Â reading, doing absolutely nothing, family celebrations, including anticipating the arrival of our granddaughter with a baby shower and serenaded by classical guitarist Craig Einhorn… all while relaxing on our porch. 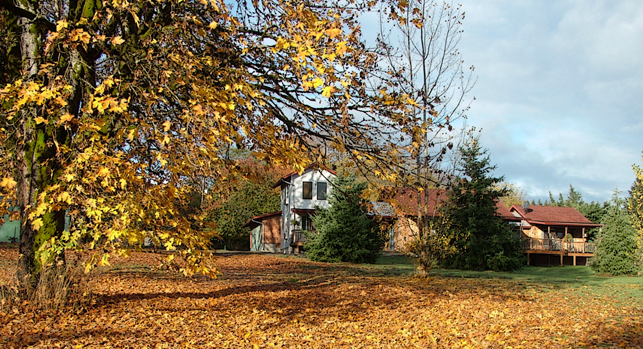 We have enjoyed warm sunny days, pouring rain, snowfall and lightning, the changing seasons, wildlife and wild birds of all kinds, listening to the sounds of nature, prayer, sunrises and star-studded nights on our porch. I love the quote “Life is made of moments; moments as big as years”. Many of those moments have been lived on our porch. My friends at Flourish just published an excellent article today. Here is an excerpt fromÂ Front Porch Revival: The Past, Present, and Possibility of a Neighborhood Mainstay by Kendra Langdon Juskus. “As Black History Month, February gives us the opportunity to reflect on defining moments and movements – some shameful, some glorious in our country’s history and culture: the abuse and enslavement of human beings; the Civil Rights movement; the presidential election of Barak Obama; the Civil War; segregation; the Harlem Renaissance; the Tuskegee Airmen; the front porch. The what? 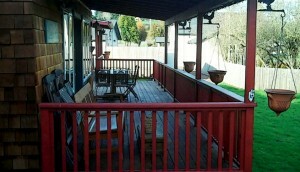 That’s right: the front porch. To mention the advent of the American front porch alongside illustrious cultural milestones like the Civil Rights Act and jazz music is not to diminish the more familiar achievements of African Americans heralded each February. Quite the opposite, it is the importance of the front porch that has been diminished by the technology- and efficiency-obsessed culture we live in today. There is much in that culture that threatens our fundamental humanity with busyness, anonymity, and industrialization. But there is much about the front porch that is human.” Read the full article.